Shobla Pine Royale is a Himalayan retreat and stands true to its name - "Shobla" which means ‘Exquisite‘ in the Local Pahari Language. Nestled on the banks of river Beas overlooking the mighty Jogni Falls, the cottage perfectly blends in with the natural surroundings of lush green pine forests. The cottage has been crafted out of stone and pine wood and it offers solitude of the Himalayas away from the hustle and bustle of the city life. 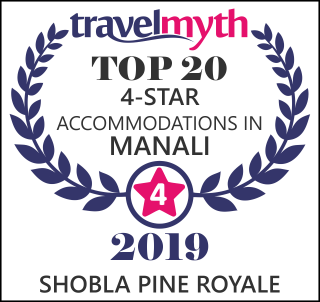 Shobla Pine Royale is a gold star rated Bed & Breakfast establishment registered with the Ministry of Tourism, India. All rooms are neatly furnished with wooden paneled walls, Kitchenette, Mini- Bar, Private balcony, King Size Bed, Shower Enclosure, Coffee Tea Maker, Hair Dryer, Toiletries etc. Panoramic view of the snow capped peaks of Rohtang and Hampta pass from every room will leave you mesmerized. Your Himalayan Odyssey awaits you.